Last night, Germany beat Argentina 4-0. I don’t particularly follow football (and if you do prefer that sort of thing, try Lower Mid-Table) but I did get a little warm feeling inside when Germany won. It also lessened the pain of England’s defeat last Sunday. Having a multinational family (English mother and German father) means that I get to (admittedly half-heartedly) support two teams in each major sporting competiton! 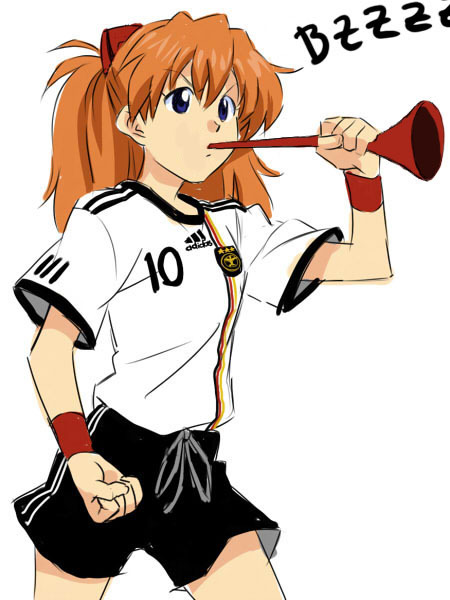 So even though England is out of the World Cup, I still have Germany to root for. This entry was posted in Thoughts and tagged argentina, asuka, football, germany, neon genesis evangelion, world cup. Bookmark the permalink.